Hello everyone! 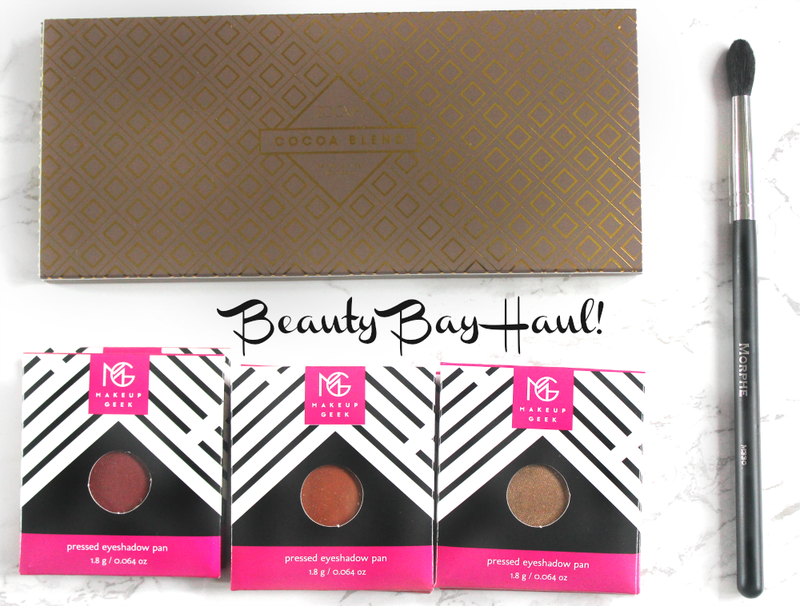 I have a very exciting post to share with you all today…it is my haul! After over 140 days of not buying makeup, this is the haul that I purchased with my gift card from work (which I talked about in my January update!). So just to clarify, I am still on my no-makeup-buying challenge till my 21st, which is exactly 90 days away now so just three months to go. Anyway I was very grateful to get a £50 voucher of my choice, it was like a little reward 5 months later for sticking at the challenge ^_^ and of course I had to pick beauty bay as they have so many wonderful things that are on my wishlist. I must say here that I am extremely impressed with beauty bay’s delivery, I placed this order at 7pm on a Thursday and it arrived at 12pm the following day! Normally I don’t have much luck with hermes delivery, but for some (great) reason my order arrived extremely quickly and everything was in tact, yay! 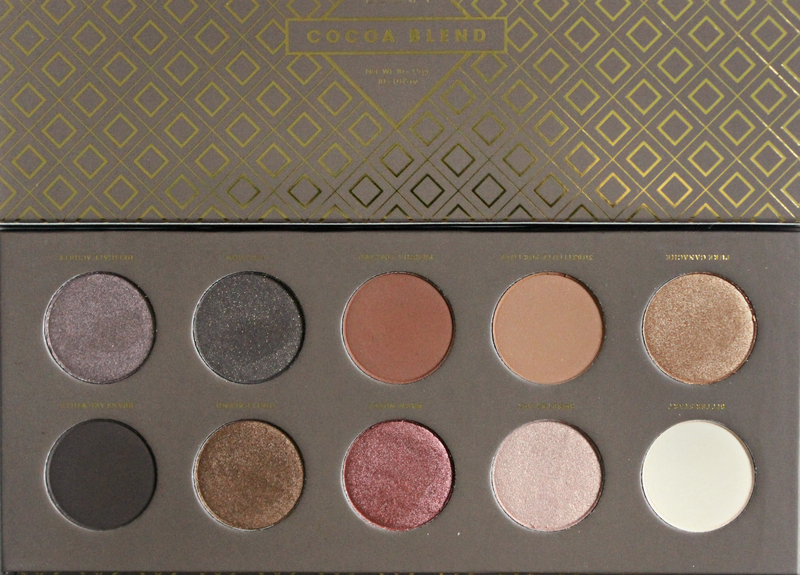 So starting with the much lusted after Zoeva Cocoa Blend Palette (£15.50) the moment I saw this popping up on blogs everywhere, I knew it had to be mine. Although it is (yet another) neutrals palette, most of the colours are useable on a regular basis and I know there are a couple of shades in particular that I’ll be gravitating towards the most! The first shades to catch my eye were ‘substitute for love’ and ‘freshly toasted’ which are both gorgeous crease and transition shades. ‘Bitter start’ is the perfect brow bone highlight and of course ‘pure canache’ is my ideal base shade - gotta have some gold! The quality of these eyeshadows are second to none, they’re so pigmented, soft and bendable and I love how the palette has it’s own sleeve too! The size of the pans are pretty decent too so overall this is a great value palette. One of the best things about owning a palette which is ‘hyped up’ or much loved, is that there are a lot of youtube tutorials focusing on this palette alone. I really appreciate that because I do tend to stick to my comfort zone when it comes to eyeshadows looks, doing the same thing over and over. So having a range of videos to draw inspiration from is super useful. I also purchased my first morphe eyeshadow brush, the M330 blending crease brush (£4.75). The main reason why I went for this one over the others was because I was determined to keep my spending total to just under £50 so I didn’t break my ban (#dedication). I also really needed another blending brush that wasn’t too big. My eyes are slightly deep-set which means I don’t have the most lid space and I find that large brushes kind of mess up the whole look! This brush is so useful and it really has met my expectations. The elongated shape and tapered tip means I can use this to apply my transition shade and crease shade and then blend it all out in a few quick strokes. It also works well for adding concentrated colour to the outer corner and in general is a fantastic addition to my collection! 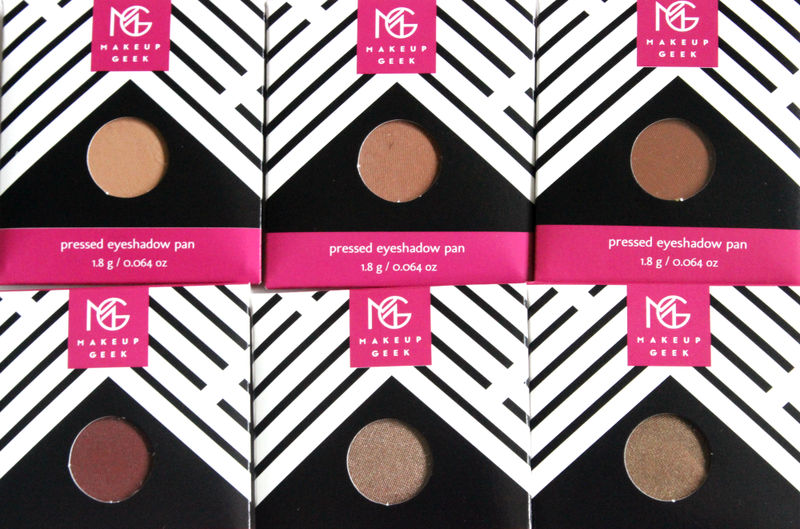 And finally, probably the most exciting part of my haul I present to you my MakeUp Geek Eyeshadows! (£4.95). Every single beauty lover will have heard of these beauties and most likely seen them in action, used by some of the biggest beauty gurus. Just in case you haven’t though, let me give you a quick introduction! MUG shadows are extremely high quality, often described as better than MAC but they’re a much more affordable (and ethical) option. I opted for 6 of the regular shadows, however there are more options on beautybay, which are a little more pricy. 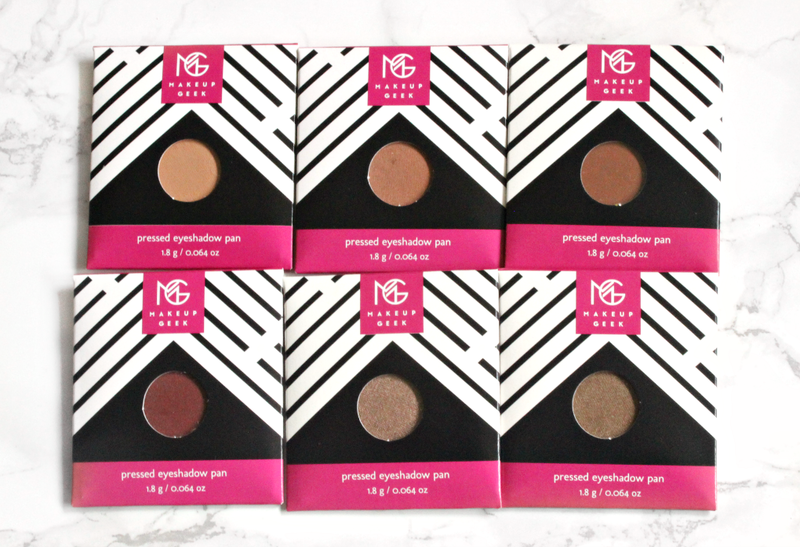 Each eyeshadow pan contains 1.8g which is fantastic value for money and of course the best thing about these shadows being sold on beauty bay is the fact that now those of us who don’t live in the U.S can get our hands on the whole range without being hit by dreaded customs! So I had the budget for 6 shadows and of course I had already watched a lot of videos and noted down the MUST have shades. I also used the lovely Jasmine’s post (here) to help me decide what my first 6 shades should be. Admittedly they don’t look exciting, however I know MUG are known for their gorgeous transition and crease shades so I had to pick up some of the ones I have been lusting after for years! From Top left I bought Creme Brûlée which is a shade I’ll be using every single time I wear eyeshadow, because it is PERFECTION at making your eyeshadow game go from a 2-8 I kid you not. You just need to use a fluffy brush to sweep this all over the crease area and it pulls together whatever you’re going to be putting on next. Frappe which is several shades deep and more brown, works in a similar way but adds depth and definition. I purchased the shades Cocoa Bear and Bitten because they are two of the most loved shades out there and they’re wonderful for the crease and for the lower lash line too. I am SO excited to play around with these because the pigmentation and quality are just wonderful! Finally the shades Homecoming and Pretentious are my ideal all over the lid kind of shades. I do love me a good gold shade too but these two stood out more to me first over the golden ones. Honestly I cannot describe the excitement I felt when getting this parcel, not only because it contains items I have wanted for months and months (if not YEARS!) but also because it was such a treat after 5 months of not buying any new makeup items! I know for a fact that I was a lot more grateful for every single item because of my challenge and I truly appreciated that excitement which definitely goes once you become a bit of a hoarder!! Have you tried anything in this haul? Any MUG recommendations? Please let me know in the comments!